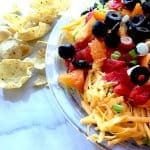 Mexican Layered Dip, no cooking and super good. Quick to make. Mexican Layered Dip: So Easy. Serve with chips. Hi. It’s Lois in the kitchen at Recipe Idea Shop. 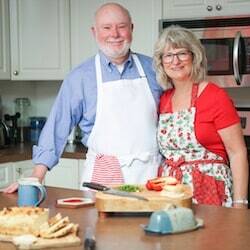 The New Jersey grandkids were here last week and I decided to make this Mexican Layered Dip recipe. It was popular in the 1980s, but I haven’t made it in a very long time! My grandkids are not very adventuresome. Are yours? Anyway, the kids skipped the dip, and the adults ate most of it. Some of the grandkids like Guacamole (avocado) and some do not. Some like beans; some do not. Oh, well! I loved it. The recipe calls for plain tomatoes, but you could also top it with Homemade Salsa. 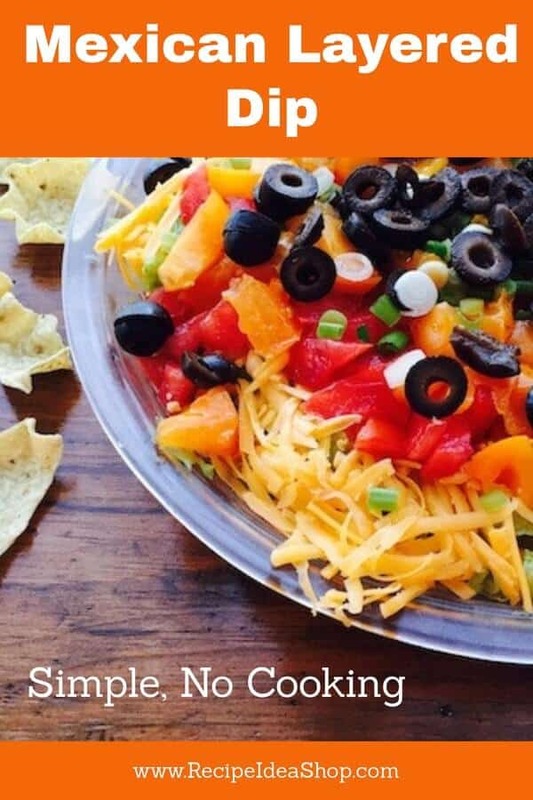 If you eat this dip with vegetables, you can cut down on the additional calories that chips add to the treat (calories for chips are not included in the Nutrition Facts label). But what the heck—I only eat stuff like this every once in awhile. Enjoy! I used my little food processor to smash up the avocado mixture. It makes it much soother. I love that little machine. Cuisinart Food Processor. Buy it on Amazon. Multiple layers of deliciousness. No cooking! Spread the refried beans in the bottom of a deep dish pie plate or a glass casserole dish (at least 3 inches deep). In a separate bowl, mix the avocado, lime juice, garlic, cilantro and salt. Spread this mixture evenly over the beans. In another bowl, mix the taco seasoning with the sour cream until smooth and pink. Spread this over the avocado layer. Sprinkle the cheese over the sour cream mixture. Spread the lettuce over the cheese. Spread the chopped tomatoes over the cheese. Sprinkle the onions and olives on top. 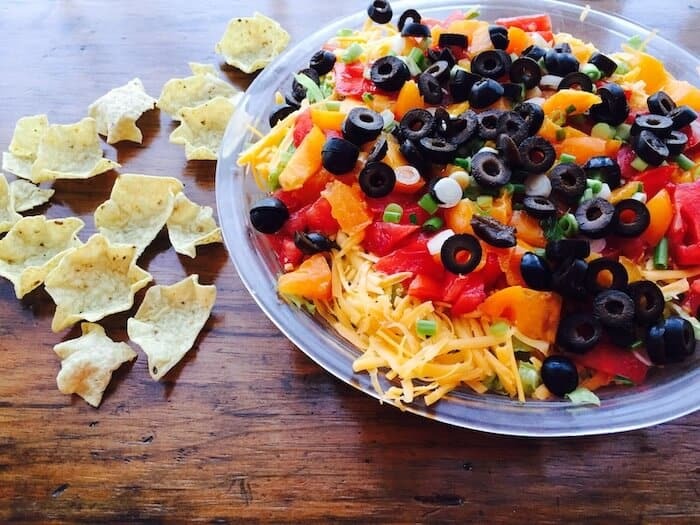 Serve with taco chips, pretzels or raw vegetables. Note: Many of the links included throughout Recipe Idea Shop are affiliate links, which means if you follow them and you buy something, we will get a small commission. It doesn’t cost you a penny more, and you can still use your Amazon Prime (Shop Amazon — Give the Gift of Amazon Prime) account to buy. This posting includes affiliate links. Don and I love our Amazon Prime account. Mexican Layered Dip Nutrition Label. Each serving is 1/12 the recipe or about 2/3 cup. Nutrition does not include chips. 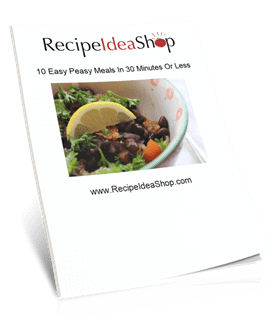 If you want more delicious recipes, please sign up for our free cookbook.